Highest Elevation: A little over 10,000 Ft- our watch that gives us the elevation is no longer working so this is a guestimate. 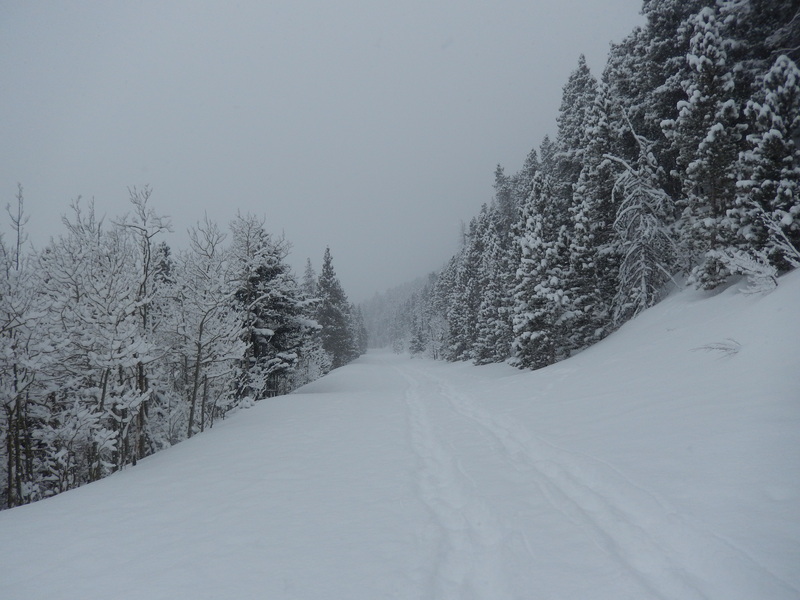 Trail Uses: Snowshoeing and Cross Country Skiing Winter only trail as it is an actual road in summer. 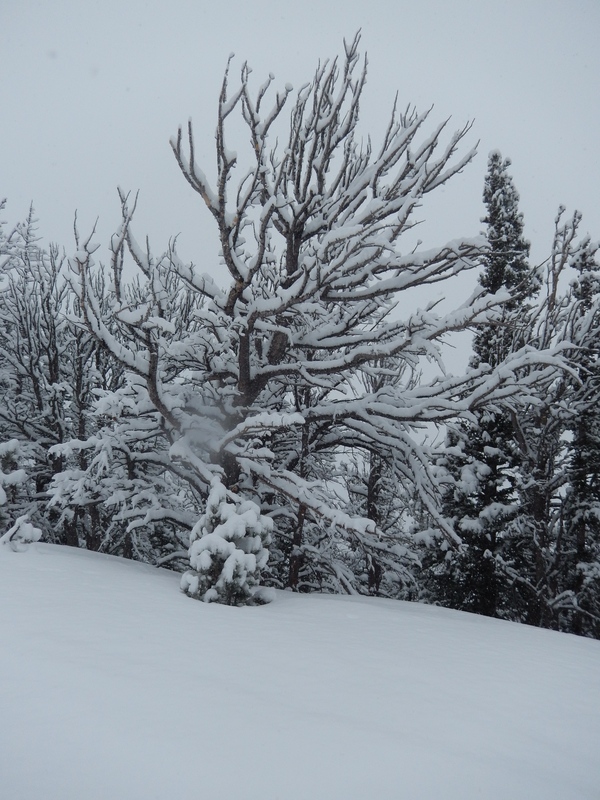 Trail Length: 5.5 miles Round trip but this can grow and shrink based on conditions. We did a little over 6 miles, it took 3.5 hours. Bathrooms: None at the road closure so hit one of the visitor centers just outside the park. 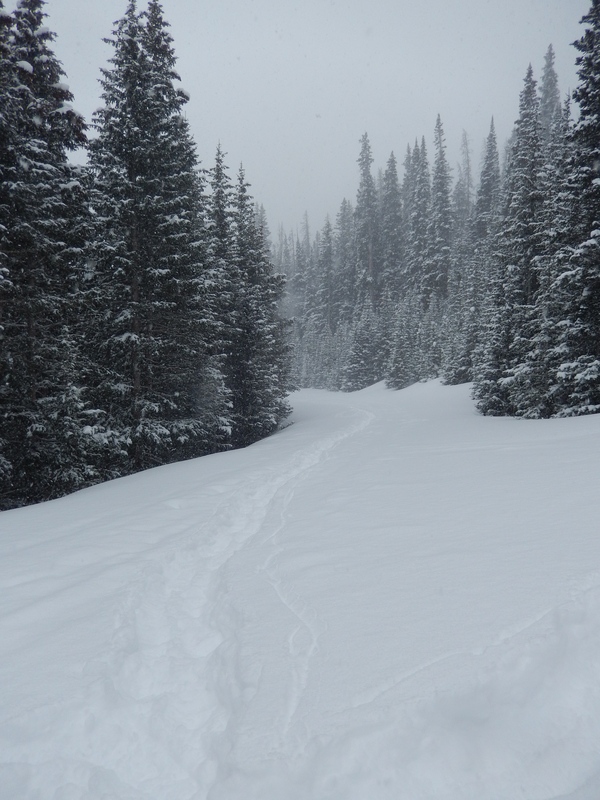 I have been trying to figure out the balance when it comes to snowshoeing, is more mileage better or steeper trails? Since last week we did a steeper trail with low mileage that felt good and maybe a little too easy. I decided this week would be better to up the mileage and keep the incline low, I was also secretly hoping we might get some magic timing again like last week and catch the amazing views that Trail Ridge Road is supposed to have. Once again the weather forecast was snowy…snowy the day before, through the night and all day Saturday and it truly was. 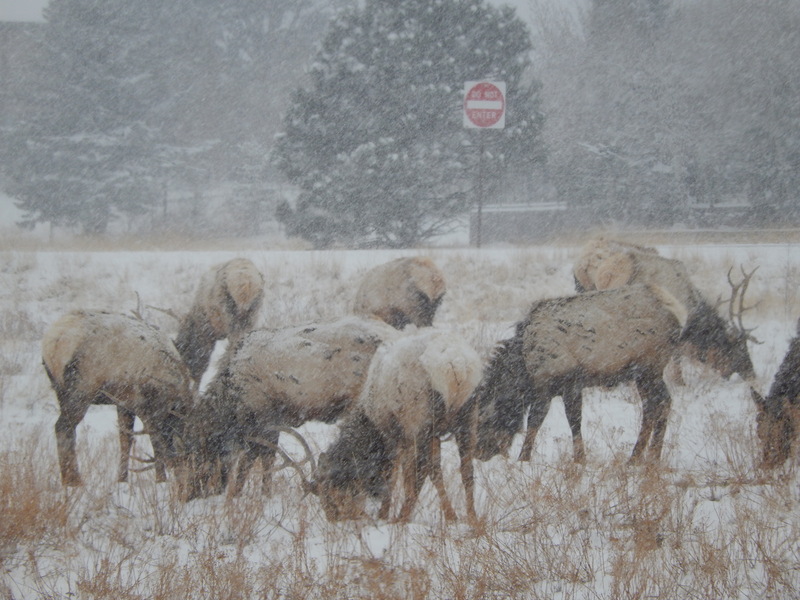 We were just outside of the Park when we came across 2 large groups of Elk. The roads were not great and the snow was pretty thick at times, so it was no surprise that when we pulled into the area cleared for parking at the road closure we were the only ones there. 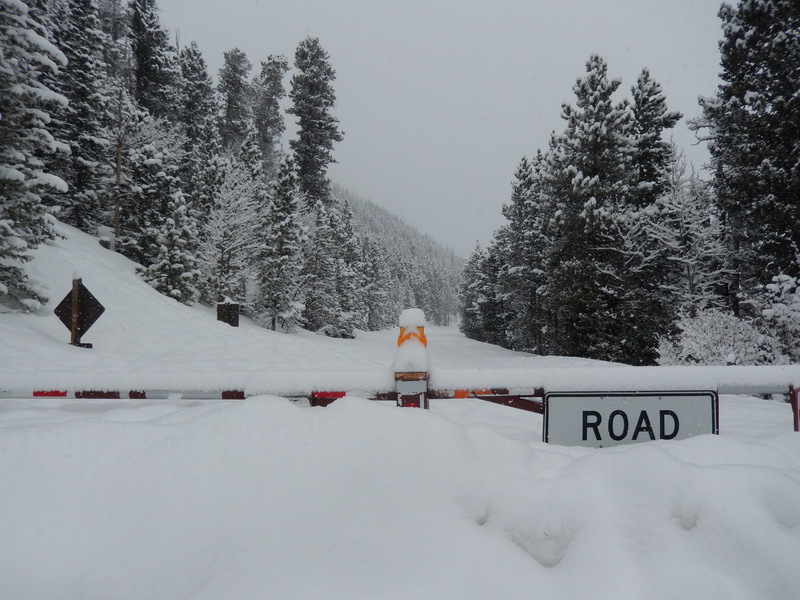 Trail Ridge road is open through the summer and is closed in the winter months until the snow is no longer an obstacle. 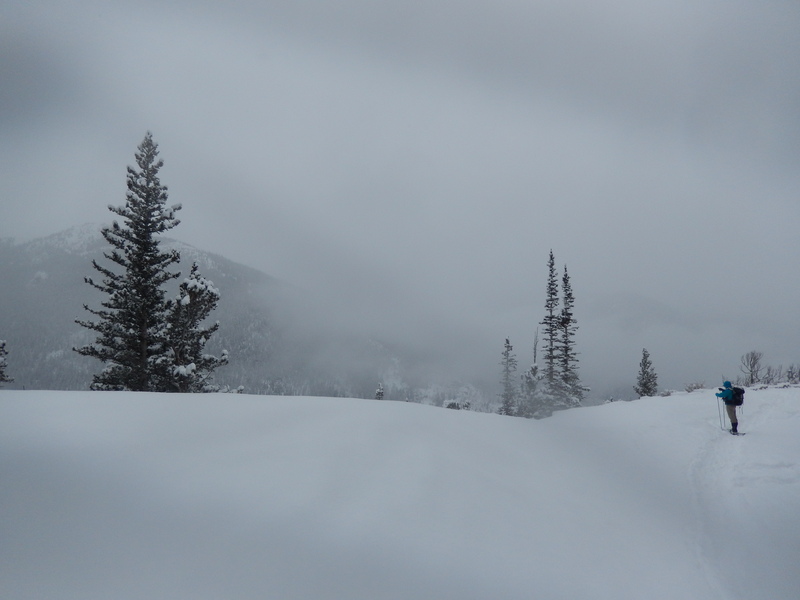 It goes over the Continental Divide in RMNP and in the winter is used as a great way to snowshoe or cross-country ski with amazing views, wicked wind and a certain level of security in that it is impossible to get lost. 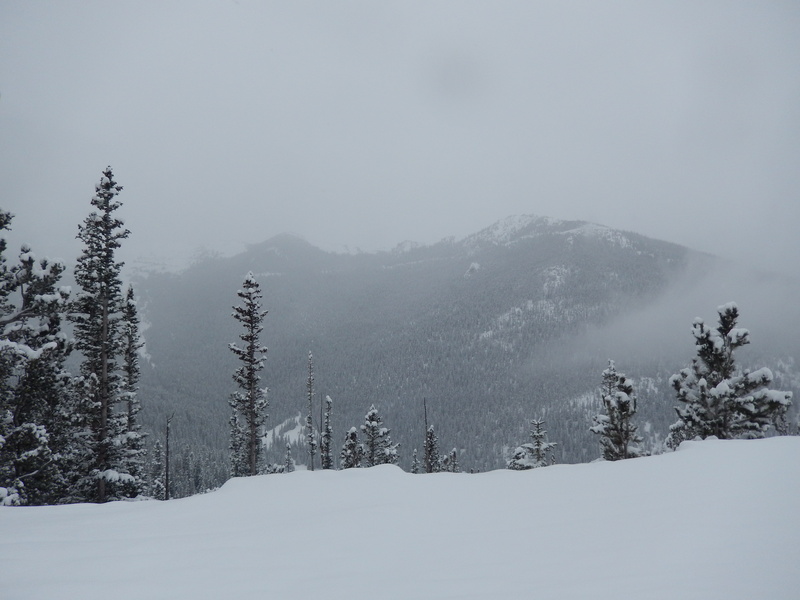 Since it was pretty obvious the snow had no intention of stopping, we were confident that there would be no views. 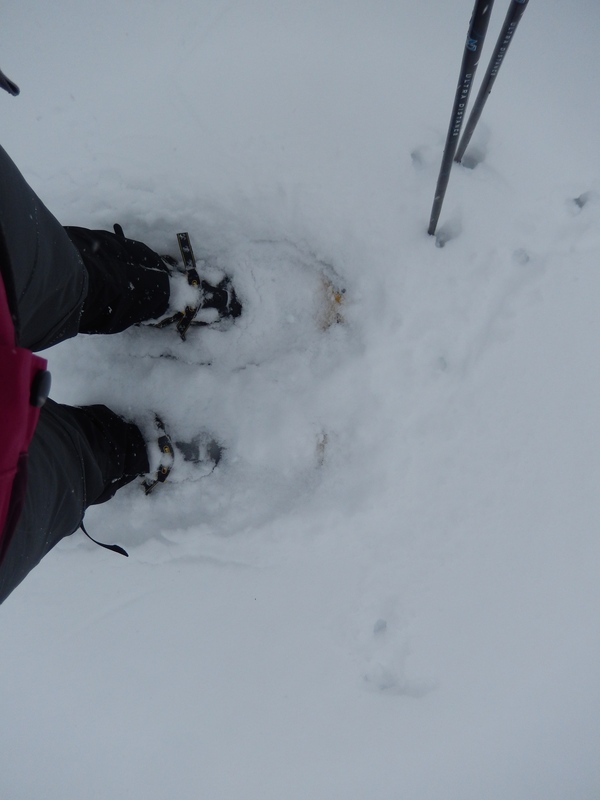 We just got our snowshoes on and started moving and at first it was decidedly….hard. 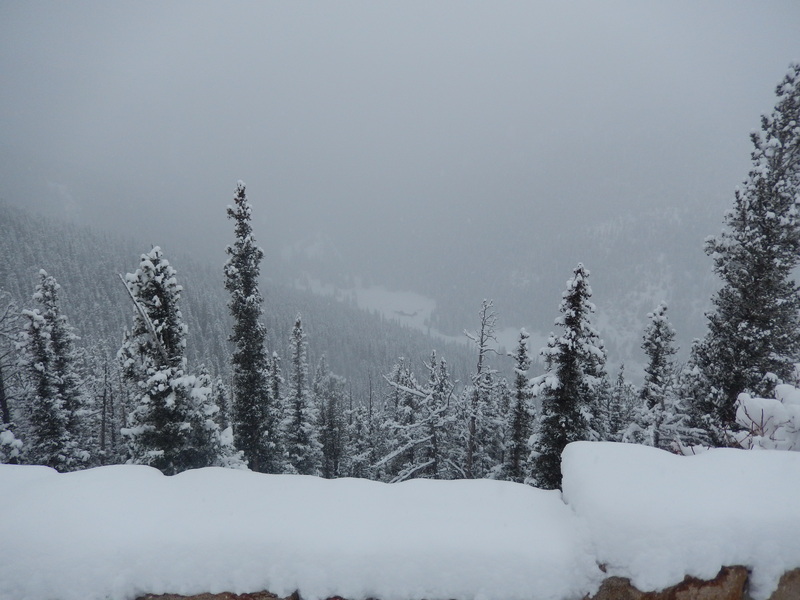 Not just because we were the first people out there in a while, but likely the altitude played a factor too. Oh and maybe the fact I overdressed. I am always amazed when I do a trail for function then get transfixed by the unexpected beauty. The snow made any views of the surrounding mountains impossible, occasionally we would catch hints of them but the snowy landscape itself was just lovely. The bonus of this particular snow storm was that the wind wasn’t all that bad so no wicked wind to make us miserable. It wasn’t too long before we got to the overlook near Hidden Valley which used to be a ski resort, in fact my sister learned to ski there, but now it is all closed down and its own snowshoe/winter fun route. You can make a difficult adventure loop by starting at either Trail Ridge Road OR Hidden valley then climb/descend to the other location. I have to be honest, staring over the edge at Hidden Valley I have no idea how you do the loop. Perhaps taking the road all the way around to that main run? I didn’t get a good shot of it to even let you all hypothesize with me. 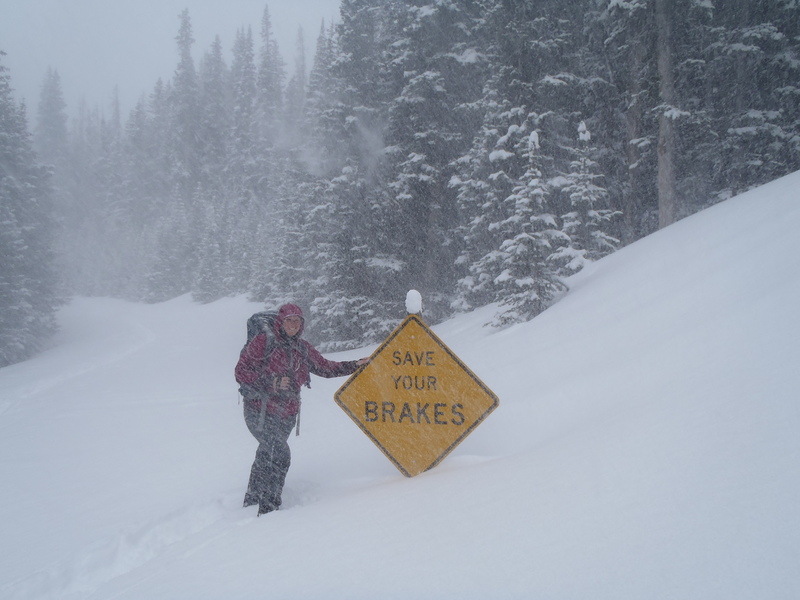 At this point on the road the snow was not very deep and we actually almost took off our snowshoes for fear of ruining the metal spikes on them. 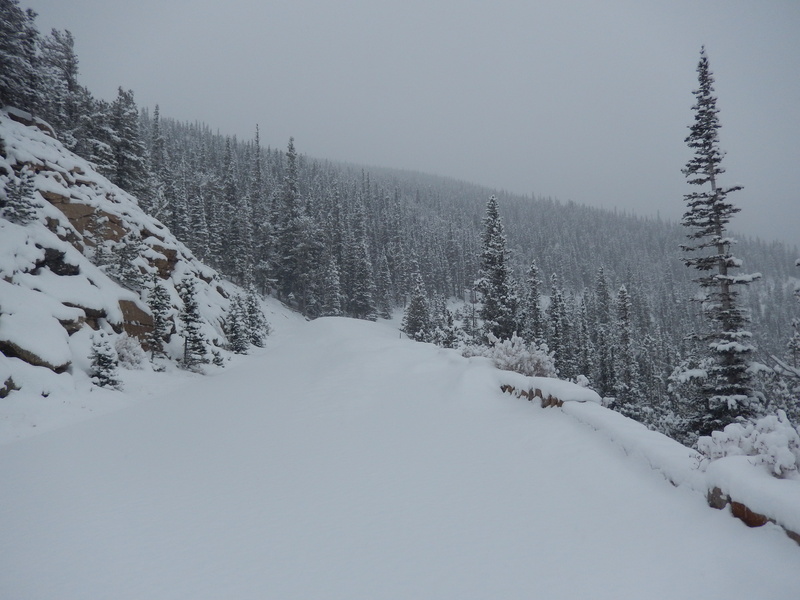 When we turned the corner up ahead it was crazy deep again, so deep we could no longer go side by side. We took turns breaking trail to help us keep some strength in reserve just in case we went further than we originally planned. Looking up ahead to where the snow gets deep. We went along the road for about 3 miles and had it all to ourselves the whole way. We decided to turn around when we got to this sign, for the record the snow wasn’t this bad the whole way it was a just well-timed gust of wind. All together we got a little over 6 miles from the snowshoe and maybe 600 feet of elevation gain. Breaking trail was great exercise, after just 3 miles my legs were solidly tired, it was nice to turnaround and head back to the car. We saw some people on the way back, I think we passed maybe 6 or 7 total the whole snowshoe, all of them taking advantage of the trail we broke. I have to be honest, I cannot wait to get back to this trail and try it again with a clear sky, the few hints of mountains we saw through out our snowshoe looked amazing! I would also like to go further than we made it last week. 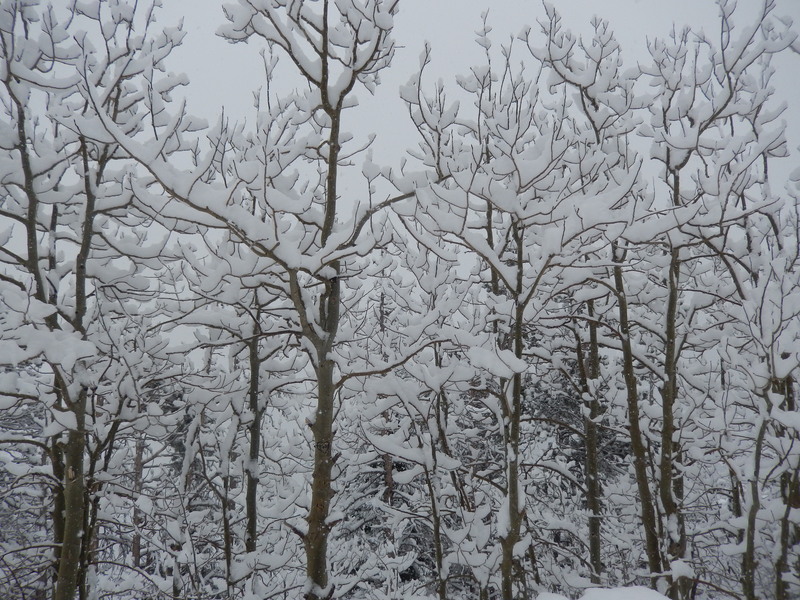 We didn’t get a ton of pictures because the snow was so heavy I was worried about hurting my new Nikon. After the directions will be a very few of our favorite pictures. 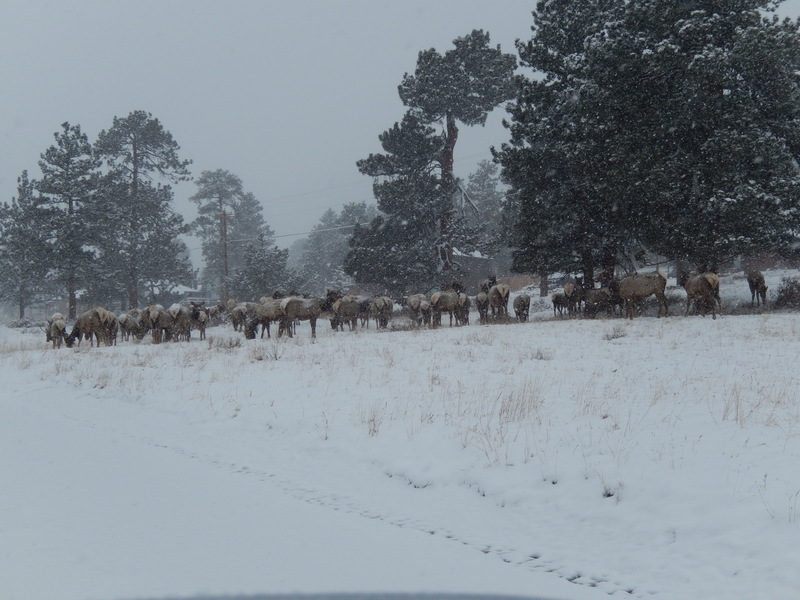 Directions: Taking 36/66 through Ester Park, at the 3rd light along main street there will be signs for the Beaver Meadows Visitor Center and RMNP, turn left. Once you cross into the park, stay straight then take this road for about 8 miles to the road closure sign. 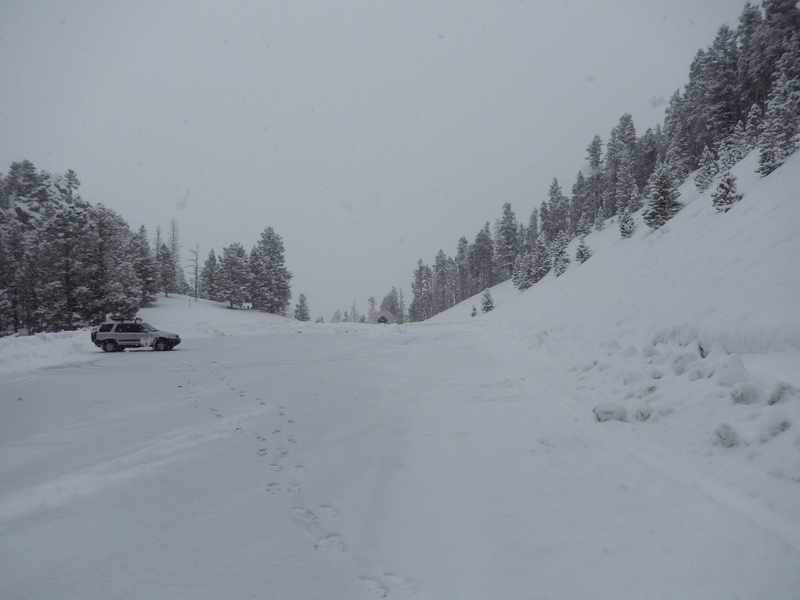 You will pass the Hidden Valley snow park on your right before the road gets curvy( hairpin turns) and then you will be at the road closure. Wow, what a lot of snow! I’d be worried about being able to drive back out of there! Lovely pics. I love that area. Going to Estes Park tomorrow……wedding planning. Thank you! Estes Park is a perfect place for a wedding! We won a contest for an all expenses paid trip there and I annoy wait for it to get here! Thanks! I hope I Can get back there soon! 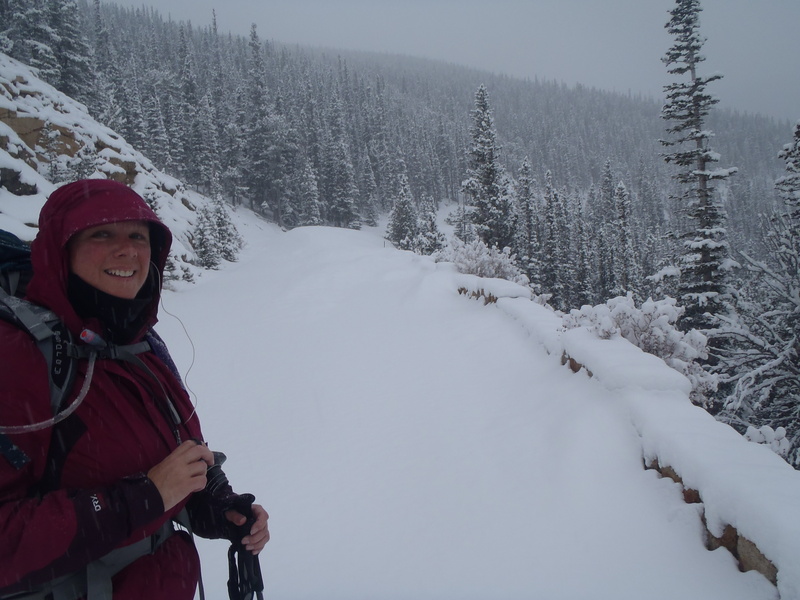 Nice to see pics of your winter hikes since I’ve barely gotten out the last couple of months! Thanks! I can’t miss a weekend otherwise my whole week is just off…. hope you get out soon! Wow, that’s an amazing amount of snow! What a fantastic hike! Please do go back in the summer so we can compare the views! I am hoping to hit it this weekend and it might be sunny…if not I will for sure be back in the summer I am dying to know what it looks like with some sun!